Who were the Black Friars? Sortebrødre is the Danish term for the Black Friars of the Dominican Order, which began in the early 13th century. The order was established by Dominic (c.1170-1221), a Spanish canon of the Augustinian Order, after he met with the Catharist heretics of Southern France. Dominic realised, that the existing orders and the priests of the secular church could no longer meet with the spiritual needs of the public. 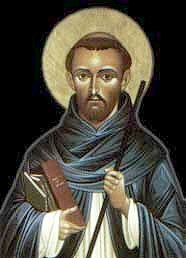 He therefore wanted to start a new community of theologically learned clerks, who could travel between towns, preaching the gospels and saving souls, while establishing an apostolic alternative to the Cathars and other heretics, by living a life of austerity and renunciation of worldly goods. The order of St Dominic received the blessing of the pope in 1216, allthough it was only acknowledged as a branch of the Augustinian Order. The official name was Ordo Praedicatorum, “the Order of the Preachers” or the Friars Preachers (in Danish prædikebrødre, “preaching brothers”). 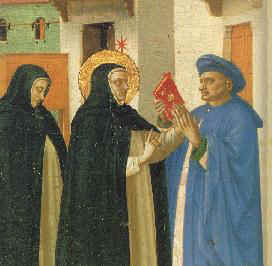 Like the other regular orders, who followed the Rule of St Augustine, the Dominicans did not make a vow of stabilitas loci (to stay at one place) and should therefore not be termed as monks, but as friars. They lived in communities in the towns, usually in rather modest buildings, which officially should not be termed as monasteries, but as priories; still, in Danish the word for monastery (kloster) is the most common term. Often the most valuable items of the priory were the books of the Dominican libraries. The schools of the Dominican Order were mainly concentrated on the education of preachers, but they could also produce great theological thinkers such as Thomas Aquinas (c.1225-1274). Their schools were also open to outside students, such as the parish priests. Possibly, it was due to this combined training in theology and preaching, that the Dominican students became skilled debaters and teachers. The new order were originally directed towards the many kinds of heretics of the High and Late Middle Ages and the Friars Preachers were put in charge of the Inquisition. The Dominican Order soon spread out from Southern France to the whole of Western Europe. The first friars arrived in Denmark in 1222, where they received the nickname Black Friars (in Danish sortebrødre, “black brothers”) because of the colour of the cloak, that they wore on top of the white habit whenever they served in the church or went outside the priory. At about the same time, another Mendicant order of St Francis, the Friars Minor - who in Denmark was to be known as de små brødre (“the small brothers”) or gråbrødre (“grey brothers”) - also introduced themselves in many European towns. Even though the two orders had several similarities on the outside, they built on rather different concepts. The common term for the brethren of both orders, Mendicants (i.e. “beggars”, in Danish tiggermunke), refered to the fact that they refused to own property (individually as well as corporate), and depended upon organised begging for their support. Among other things, the Mendicant Orders came into life as a sign of the increasing criticism against the existing orders (especially the Cistercians, who had Zealand monasteries at Sorø and Esrum), who were said to be more concerned with collecting and administrating estates, than with living the apostolic life. 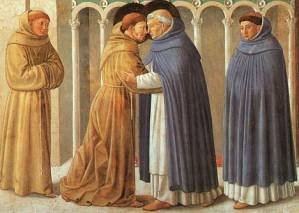 The sincere austerity of the friars was therefore a powerful weapon against the heretics, as the poverty made the brethren both trustworthy and mobile. At the same time, however, the Mendicants became dependent on the good will and generosity of the townspeople, wherever they came. The Mendicant Orders broke from traditional monasticism by abandoning the seclusion and enclosure of the cloister in order to engage in an active pastoral mission to the society of their time. The success of the Dominicans built, in a matter of speaking, on good marketing. They came to the people, where the people was, and gave to the people, what the people wanted: good preaching (from 1236 even in the local languages) about how to live the apostolic life of piety and poverty, which the brethren themselves were the ultimate example of. The Mendicants also came to the sick and the poor of the town, to bring them words of comfort and relieving herbal extracts. To many members of the rich bourgeoisie, the Mendicants appeared to live as close to the apostolic ideal as humanly possible. The Black Friars received still more donations and requests for burial places in the Dominican churches, which many merchant families preferred to the local parish churches. This of course could create some rivalry with the priests of the secular church, but there are also many indications of good relations between the secular priests and the friars. As an example of this is the fact, that the Dominican schools also were open to the public, which the secular priests benefited from. 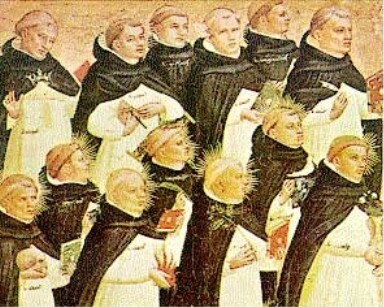 The Dominican Order was especially interested in recruiting well-educated youth, which usually came from the higher urban classes. Also the sons of artisans and farmers would join the communities, often as lay brothers (conversi), a lower educated group of the brethren, who took care of the more practical duties in the priory, but they too worked in the streets and market places with the preachers. The friars chosen for preaching spent a lot of their time on their own studying in the cells of the priory or practising their skills of preaching and argumentation with the other preachers, all under careful observation by the elder friars and the lecturer in particular. When the friars were considered sufficiently educated, they were sent out in the streets (always in pairs) to help the good people of the town to receive the Gospel and repent their sins. 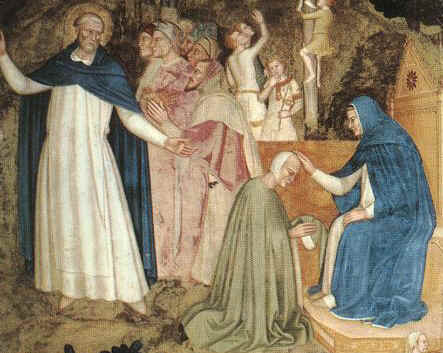 While offering these services to the lay people, the friars received small donations of money or goods, which they brought back home to the priory. 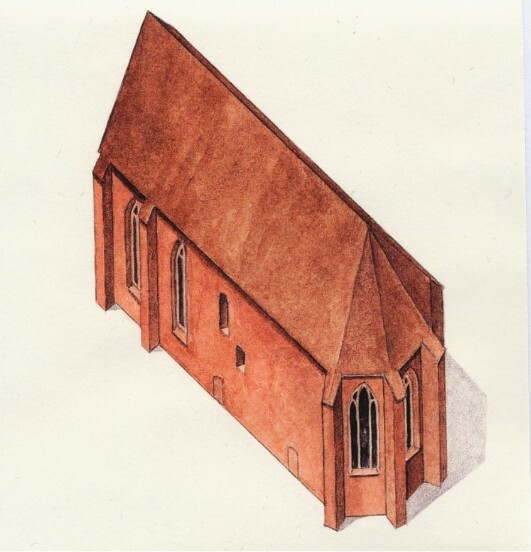 Another significant part of the life of the Black Friars (just like any other monastic order) was the singing of the Divine Office in the priory church at the canonical hours; 6-7 daily liturgical offices, of which several attracted many lay visitors, who wanted to enjoy the graceful singing of hymns. Besides these daily routines, the Black Friars had to perform still more requiem masses for the souls of late brethren and lay benefactors of the community. The services in the church could often become a problem, as it was never regarded as important for a friar as for a monk. On the other hand, the celebration of the requiem masses and the Divine Office served a rather important part of the “public relations” of the Black Friars towards the people of their town - and the potential benefactors. As a result, the Dominican Order always tried to make their communities as large as possible, so that their friars were given more freedom to study or work in the streets, without the need to worry about the celebrating of the next mass. In addition, it could be a problem to find good enough lecturers if there were too many small priories, as every priory was to have its own lecturer. A community had to consist of at least 12 brethren, as this was the number necessary to exercise the Divine Office. Besides the actual friars, the community had a number of lay brothers and novices. The community itself chose the head of the priory, the prior, among the eldest and wisest of the friars. He was held responsible for the overall condition of the priory and was to give annual reports to the provincial chapter of the Dominican Order (in the Nordic province of Dacia). There were several other important functions in the priory, such as the gatekeeper, the kitchen master and the gardener. In connection to many priories, a lodging house (for both travelling Black Friars and lay people) was allocated and perhaps even a small hospital; at least there was usually one brother of the community who knew how to treat the most common illnesses and how to perform the traditional blood-lettings. It is believed that about 20 Dominican priories existed in Denmark in the Middle Ages. Two of these were convents for nuns. They were all terminated during the times of the Reformation and only a few of them have (partially) survived until today. The priory of the Black Friars in Holbæk represents the only remaining buildings of the Dominican Order on the Danish Isles. In three Jutland cities (Viborg, Århus and Ribe), it is still possible to experience the medieval milieu of the Black Friars, in more or less complete priories, also including the Dominican churches. The Black Friars arrived in Holbæk in 1269 or 1275. Other towns in Zealand with Dominican priories were Roskilde (1231-34), Vordingborg (1253), Næstved (c.1260s) and Ellsinore (1441), while a Dominican convent for nuns was founded in Roskilde in 1263. Also Slagelse may have had a community in the 13th century before the foundation in Holbæk. The priory in Holbæk was built on a vacant area south of the medieval town. The friars did not get an easy start in Holbæk, as a Franciscan chronicle from Roskilde tells us, that in 1287 »the house of the friars burned down together with the entire city of Holbæk«. In the early 1290s, the outlawed Marshal Stig and his followers ravaged the town. Finally, in 1323 Bishop Niels of Børglum could consecrate the church of the Black Friars of Holbæk. 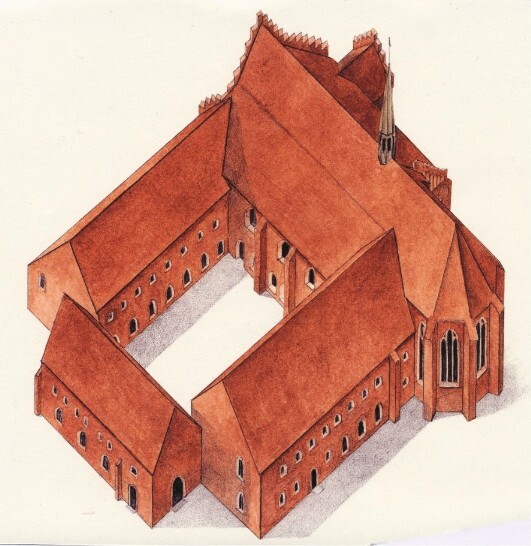 The church was to become the northern wing of a four-wing priory, as it was common with both the Dominicans and all other orders. 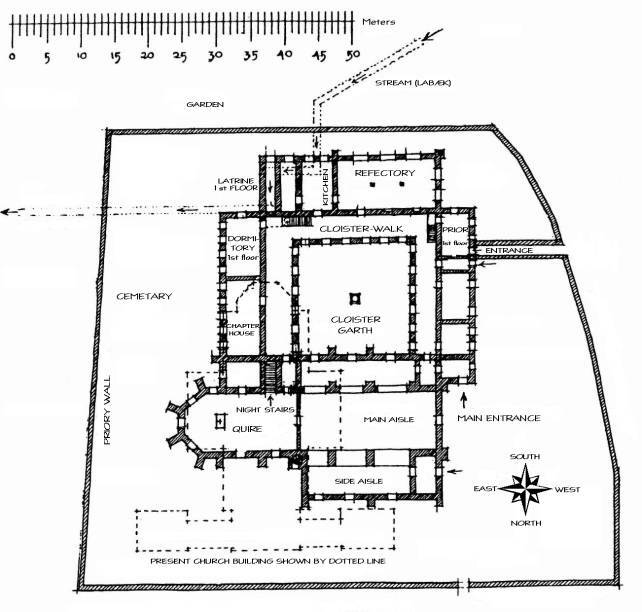 At first, the church was probably only accompanied by an eastern wing, presumably a two storey building, where the friars had their daily meeting room (the chapterhouse) on the ground floor. Other monastic orders would usually have a common dormitory on the first floor of the eastern wing, but with the Dominicans, this was changed into a number of small cells, where the friars could study and sleep individually. Sometimes a small staircase from the dormitory to the church quire would ease the brethren’s way to the nightly services of the Divine Office. Probably, the priory had a number of small rooms for safekeeping of books. Unfortunately, we know very little about this eastern wing of the priory, which was demolished just after the Reformation. The oldest still existing part of the Dominican priory in Holbæk is the southern wing, which can be dated to the early or middle 15th century. This wing too was built in two storeys, with an arched ceiling and a cellar. The original cellar still exists, while the arches have been reconstructed. This building most likely contained the kitchen and the dining hall (refectorium) of the priory, which might even have had the pleasures of “running water”. Possibly, a small stream was led through the eastern part of the wing, for the benefit of the kitchen, a washroom and a latrine (in that respectable order); many of the medieval monks and friars had rather sophisticated knowledge of hydraulics. Together with the eastern wing, the eastern part of the southern wing was demolished after the Reformation. The dining hall, on the other hand, is expected to have been quite similar to the still existing “klostersal” (priory hall). The youngest part of the priory is the western wing, which has been dated to the early 16th century. 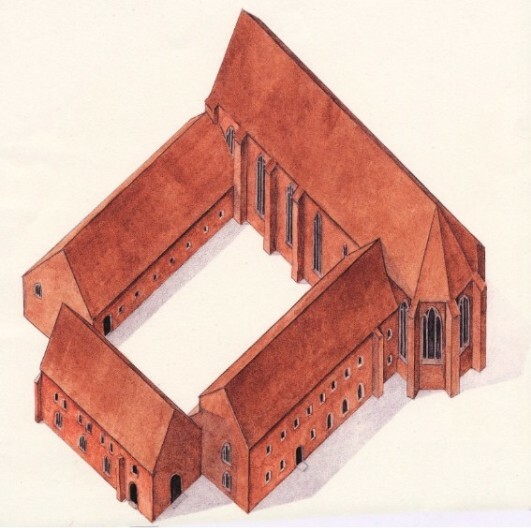 It is possible, however, that the priory also in earlier times formed a closed group of buildings, as the present western wing might have replaced an earlier and simpler wing or a wall. This too was a two-storey building, built in red stones as the rest of the priory, with an arched ceiling on the ground floor. In both the southern and the western wing, the arches have been decorated with frescos. There do not seem to be any strict regularity as to what the western wing of a Dominican priory was used for, but many priories are known to have used them for libraries and schools, a tendency especially significant in the late Middle Ages. In Holbæk, we also have reason to believe that both the prior and the gatekeeper had their rooms in this wing. On the eastern side of the west wing, directed into the cloister, remnants of a covered cloister-walk have been found. A wall was surrounding the entire priory and remnants of this can still be seen to the southeast of the church. On the inside of the wall, to the east of the long gone eastern wing, was the cemetery of the priory. To the south of the buildings was the garden of the brethren. Just as in the rest of the European cities, the Black Friars seem to have been quite popular in Holbæk for a long period. 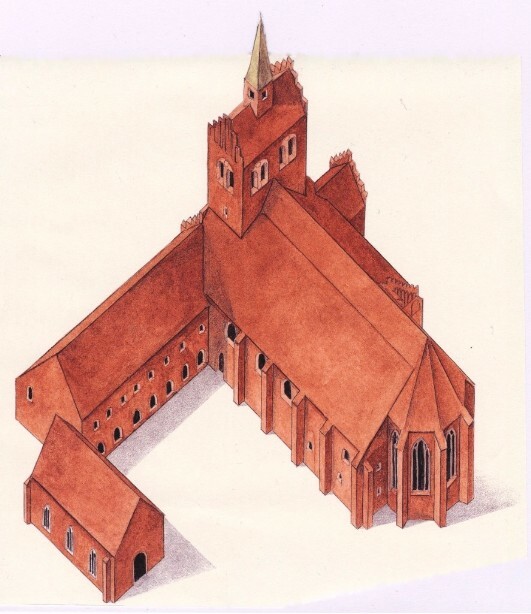 Among other things, the several extensions and additions to the church and the rest of the priory indicate this. Such building projects must have been quite expensive and according to the rules of the order, they could only be financed by gifts from people outside the order. One of the more generous contributions, which is known to have financed a major extension to the church in 1456, came from Queen Dorothea. Actually, it seems as if most of the major building projects were based on royal support. But if such extensions were to have any meaning at all, they must be seen as signs of a growing interest among the local citizens for the priory church and perhaps even by young men of Holbæk to join the community. In the early 16th century, the Mendicant Orders especially suffered in the clash between the reformists and the orthodox Catholic Church. 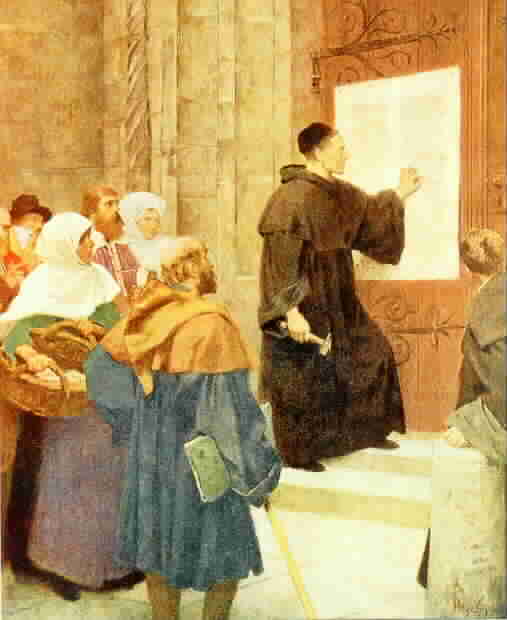 Reformed secular clerks managed to turn the public opinion against the friars of all orders in the Danish cities. Also, the Black Friars of Holbæk must have feared some sort of infringement, as they obtained a letter of protection from Count Christopher of Oldenburg during a Danish civil war 1533-1536, known as Grevens Fejde (“The Feud of the Count”). 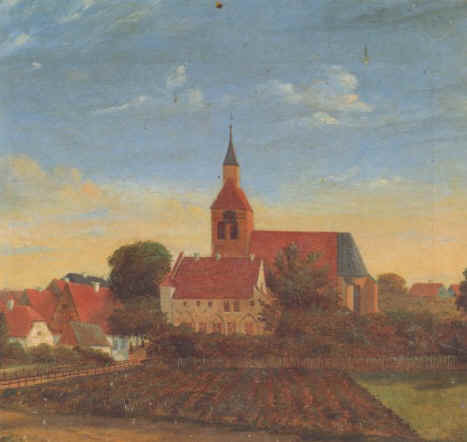 February 1535, however, the friars themselves gave up their presence in Holbæk and the priory was given to the citizens of Holbæk, as a place for the sick and the poor. More than physical abuse, the friars of Holbæk seem to have given up because of a lack of economic support from the surrounding society, which was so vital for their existence. We do not know whereto the Black Friars of Holbæk went, but the order of St Dominic continued to work in the Roman Catholic countries of Southern Europe. From other Danish towns, we even have examples of former Mendicant friars who became reformed parish vicars. 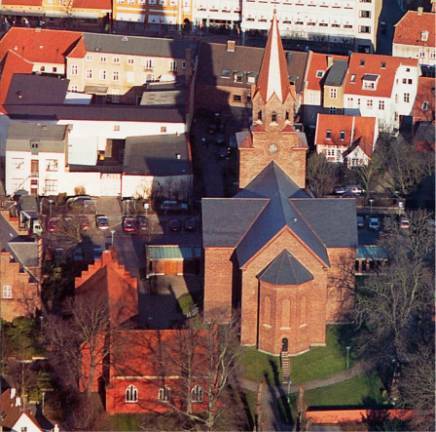 The citizens of Holbæk soon decided to turn the grand Dominican church into a parish church. For the rest of the buildings, King Christian III did not pay much attention to the wish of the friars, about using the abandoned priory for the benefit of the poor. In 1536, he gave the orders to tear down the domestic buildings of the priory and let the stones be used for improvements on Holbæk Castle. Evidently, the citizens must have succeeded in changing his mind, even though it appears to have been a little late: The eastern wing and perhaps also the eastern part of the southern wing were already demolished. The remaining buildings of the Black Friars were hereafter in the hands of the city. The western wing became a grammar school for the privileged youth, while the southern wing was turned into a city hall. An elevated first floor in the western end of this wing was used as jail and was for this reason known as the “Prison Tower”. The grammar school was closed in 1739 during a major educational reform in Denmark. Hereafter, the “Latin School” became a “Danish (elementary) School” for the children of all social classes. In 1902, the school was moved to another site and the western wing of the priory became residence for the new public library. For a period in the 1910s, the city museum used the rooms of the ground floor. In 1922, the interior of the western wing underwent a major rebuilding. For the southern wing, the time as city hall continued to 1844. Then came a period of 20 years, where the pious will of the long gone friars was actually followed: the southern building became a home for the poor and was used as a hospital during the cholera epidemics in the middle of the 19th century. This ended in 1863, where the southern wing was rebuilt into its present exterior form and the medieval refectory was turned into a mortuary. The original arches of the refectory hall had been torn down in 1783, along with the “Prison Tower”, but in 1916, six new arches replaced the flat plaster ceiling of the mortuary. 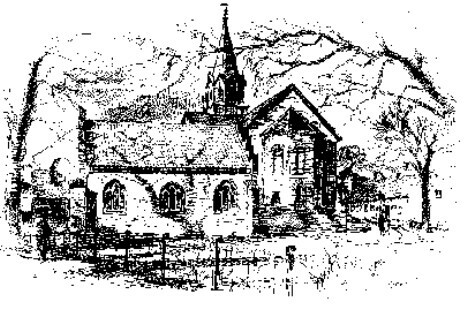 Unfortunately, the medieval convent church does not exist anymore, as it was torn down in 1869 to be replaced by a more modern building. 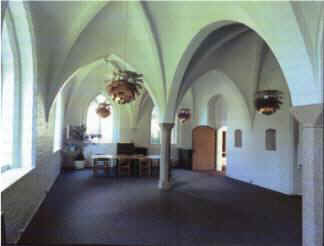 While the new church was built in 1869-1872, the hall of the southern wing (in Danish known as Klostersalen) served as a temporary church room. The two tombstones in the eastern wall of the hall were originally placed in the old church. The one to the left commemorates a commander of Holbæk Castle, Christoffer von Festenberg Pax (†1608), together with his wife and children, while the stone on the right pictures a local vicar and a curate from the early 17th century. In 1959, the library moved out of the western wing and later the mortuary was transferred to the new cemetery in the eastern part of town. The old Dominican buildings were once again restored in the 1970s, and the premises were converted into offices for the parish administration and meeting facilities for the Church of St Nicholas (Skt. Nikolai Kirke). One could say, that the parish clerk has returned to the old priory after a century, as the clerk actually had his private residence in the buildings back in the 1870s, along with a small garden south of the priory, where also the medieval friars had grown their vegetables and herbs. Today, however, the parish clerk only resides here during office hours. The latest restoration was meant to recreate the original appearance of the priory as much as possible. This aim did not only include the actual buildings, but also the entire environment around the premises, where the grounds should offer a peaceful place in the middle of town.